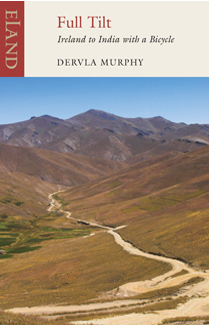 Dervla Murphy must be the toughest female travel writer of our age. One turns the page only twice in this latest book before finding her beaten by club-wielding paramilitary troopers as she flees a protest rally in Nairobi. And almost its final image is of her alone in the middle of the Zimbabwean bush, 40 miles from the nearest doctor, exhausted, prostrate, head cushioned on an elephant turd - all the consequence of a severe malaria attack. Yet, the 3,000 miles between these two fraught moments were covered on a bicycle which she bought on her 60th birthday. . . 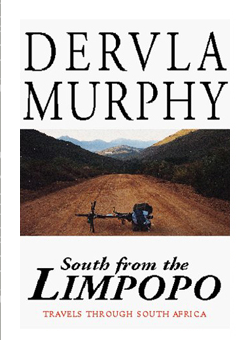 When Dervla Murphy first pedalled across the Limpopo she fancied that she ‘understood’ South Africa’s problems because for more than forty years she had – from a distance – taken a particular interest in them. Twelve hours later that illusion was shattered. South from the Limpopo reflects her moods of confusion and elation, hope and disappointment as she tries to come to terms with a country even more complex and fractured – but also more flexible – than she had expected. Her journey of over 6,000 miles took her through all nine provinces of the new South Africa. From remote impoverished ex-homeland villages, to the luxurious homes of rich whites, the scruffy homes of poor whites and in the black township of Khayelitsha, Dervla experienced the contrasting social conditions of South Africa’s people. 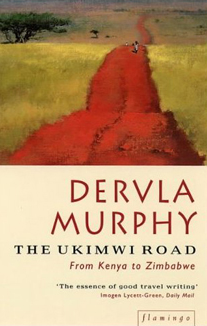 Dervla Murphy bicycled alone through this extraordinary and haunting nation during a period of great uncertainty and tumultuous change (before, during and after the elections) with her remarkable ability to mix and share with people of all colours, creeds and political persuasions, she provides a unique perspective on South Africa with its apparently insoluble problems and desperate inequalities – a country she truly came to love. When Dervla Murphy was ten, she was given a bicycle and an atlas, and within days she was secretly planning a trip to India. At the age of thirty-one, in 1963, she finally set off and this book is based on the daily diary she kept while riding through Persia, Afghanistan and aver the Himalayas to Pakistan and India. Alone woman on a bicycle (with a revolver in her trouser pocket) was an almost unknown occurrence and a focus of enormous interest wherever she went. Undaunted by snow in alarming quantites, and using her .25 pistol on starving wolves in Bulgaria and to scare lecherous Kurds in Persia, her resourcefulness and the blind eye she turned to personal danger and extreme discomfort were remarkable. 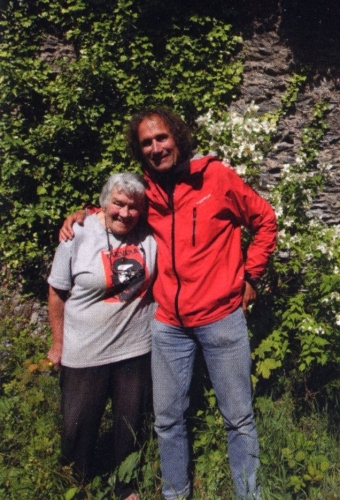 Nous sommes à Lismore, à quelques heures de route de Dublin et venons de frapper à la porte d’une grande dame, qui n’a pas perdu une once de passion en poursuivant son petit bonhomme de chemin. Elle nous accueille par une énergique poignée de main et un « Une bière ? ». S’éclipse et s’en revient, empoignant trois canettes fraîches, suivie par ses trois chiens,dont l’un s’appelle Guinness, comme la bière qu’elle apprécie. Dervla prend le temps de recevoir, avec le sourire et à la bonne franquette. Elle n’est pas du genre à s’embarrasser de formalités. Pain maison, olives, bière et ginger ale. Tout y est brut et délicieux à la fois, sans manières ni faux-semblants. Le thé aussi coule à profusion, Dervla veille à ce que nos verres soient pleins. Il fallait s’y attendre, la conversation nous entraînera loin de Lismore, très loin et dans toutes les directions. Elle est comme ça Dervla. Intrépide, émerveillée. Sacrée Dervla ! En matière d’interview, c’est elle qui me pose des questions, le regard vif, éclatant volontiers de rire, curieuse de tout, de connaître nos avis. Tempérament sanguin. La simplicité même liée à l’érudition. Cheveux courts, masculine. Sa voix rauque trahit un excès d’alcool, de cigarettes et de café. Elle tient sa révolte et son érudition de son père bibliothécaire, un fier indépendantiste, autrefois proche de l’IRA. Sa mère, malgré sa maladie dégénérative ne s’est jamais plainte et l’a beaucoup encouragée. « C’était ma grande ambition d’écrire. Il est important de savoir jeune ce qu’on sait faire et d’accepter ses limites. Je n’ai par exemple aucun talent pour les langues étrangères ou la photographie, qui ne sert que de notes à ma mémoire. » « J’ai le privilège de vivre de ce que j’aime », ajoute-t-elle. « Avec l’âge, cela devient de plus en plus dur d’écrire. Ma fille me seconde et s’occupe de l’editing ».